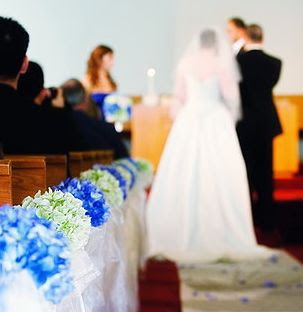 If you are getting married in a church like I did, one decoration you shouldn't overlook is decorating the ends of the pews in the center aisle. 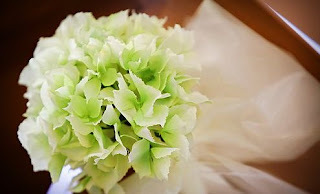 When I was buying flowers for my bouquets, I bought extra hydrangea stems (fortunately they were on clearance) and made pew bows for decorations at the wedding ceremony. The stem was taped onto a pew clip (which can be purchased from orientaltrading.com) and then I added 6" organza ribbon to make the bow and hanging ribbon. I also added some 1.5" satin ribbon for more interest. To transport all of them and keep the ribbons from wrinkling I hung them all on plastic hangers. I was able to get 8 of them on one hanger. 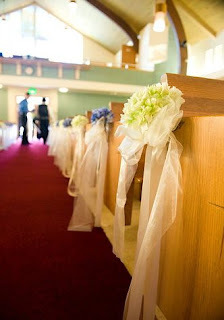 After the wedding I was able to recoup a lot of the costs by selling all of the pew bows to a Craigslister who just happened to be planning her own wedding with the same color scheme. You can't do that with real flowers! For a variation you could make pew bows without the flowers on top and you could add colorful ribbons instead. Such an emotional and adorable share this is! Got to know about one of the alluring Seattle Wedding venues and planning to book one for the baby shower of my sister in a couple of weeks. Date is not yet finalized but it will be a grand luncheon with all dear ones. Catering and baking part will be in buffet and self décor will be done to cut the cost.